Gov. 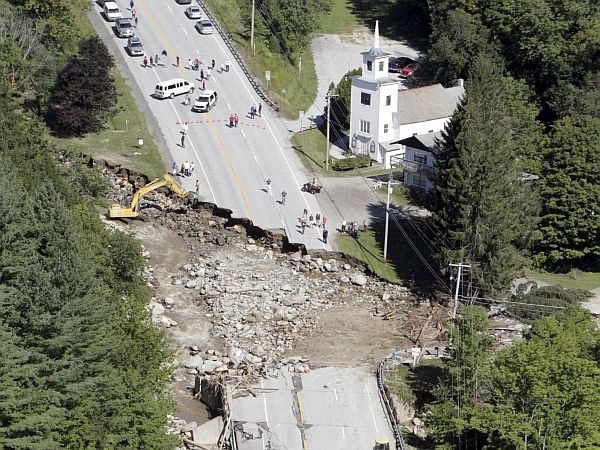 Peter Shumlin wants the president to increase the state’s federal reimbursement for damage caused by Tropical Storm Irene from 75 to 90 percent. The Brattleboro Reformer reports that Shumlin sent President Obama the request after storm damage costs exceeded $79 million – the threshold that triggers a higher reimbursement rate from the Federal Emergency Management Agency. State recovery and rebuilding costs have reached more than $82 million. Shumlin says if the request is approved, Vermont would receive another $30 million. Shumlin is also asking the president to increase the FEMA cost share for a snowstorm, windstorm and flooding that hit Vermont over the past year. The cost of Irene repair work continues to saddle city and town finances. Town officials in Townshend now say municipal and highway projects have amounted to more than $865,000. With no reimbursements from either the state or federal government yet, the Windham County town is projecting a deficit of more than $600,000. At a special meeting last week, Townshend’s Select Board voted to seek a $500,000 commercial loan to offset those costs. The state is appealing a ruling by the Federal Emergency Management Agency that denied full funding for a culvert in Townshend destroyed by Tropical Storm Irene. A stream crossing in Townshend is the test culvert for building back town infrastructure in a more resilient fashion after the devastation of Tropical Storm Irene. The Federal Emergency Management Agency says it won’t pay for larger culverts like the one in Townshend that the state says are needed to withstand future floods. FEMA says the state is applying inconsistent standards.